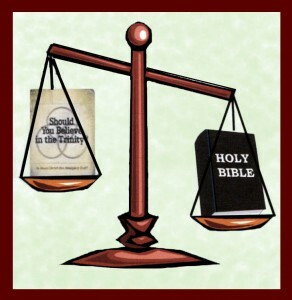 Should You Believe in the Watchtower or Is Jesus Christ Almighty God? Should you believe in the Trinity? This is the question raised by the widely circulated, 1989 booklet published by the Watchtower Bible and Tract Society (WTBTS)*, appropriately titled Should You Believe in the Trinity?and subtitled Is Jesus Christ the Almighty God?1 Well, should we believe in the Trinity? Is Jesus Christ Almighty God? It seems more popular than ever to deny the closely related doctrines of the Trinity and the Deity of Christ. Cults of all stripes, popular false teachers such as Gwen Shamblin of Weigh Down Workshop fame, Liberal scholars, Unitarians (of course), Muslims, New Agers, as well as countless others deny the Trinity and the Deity of Christ up one side and down the other. Are they right? Can 10,000 Frenchmen be wrong? No, they are NOT right; and yes, 10,000 Frenchmen CAN be wrong. Probably the most important doctrine of the Christian faith is the Deity of Christ. Even so, most Christians, while believing that Jesus Christ is God, cannot adequately defend the teaching from the Scriptures. It is tough, if not impossible, to defend or even explain the Deity of Christ without at least a rudimentary understanding of the Trinity doctrine. This can be even more difficult for the average Christian to defend to anyone who would challenge the truth of the doctrine. Sadly, many Christians themselves are fairly confused in their understanding of the Trinity. Does the doctrine teach there are three Gods in one, or is our God one person Who manifests Himself in three different modes at different times? Neither of these is true, but scandalously, many Christians do not know this! Our God is ONE God Who exists eternally in three persons, not three modes or manifestations. The Father is NOT the Son, and the Son is NOT the Holy Spirit. Even if our finite minds cannot perfectly comprehend how these things can be so, we all need to understand and be able to make the case that it is BIBLICAL and true or we will continue to be easy prey for Jehovah’s Witnesses (JWs) and other anti-Trinitarians. It is beyond the scope of this one article to make an all-encompassing case for the Trinity or even to explore fully all the arguments— pro and con—having to do with the Deity of Christ. But we will explore some of the objections given by false teachers by using the specific arguments advanced by the WTBTS— the most polished of all Trinity/Deity-of-Christ deniers—with the hope that the reader will go beyond this modest effort and study this very important doctrine in depth. The Should You Believe in the Trinity? booklet, which I shall hereon refer to as the Trinity booklet to save typing ☺, purportedly proves the Trinity/Deity-of-Christ doctrines are unreasonable, confusing, God dishonoring, unbiblical, and heretical. They quote (or rather, misquote) numerous genuine Christian publications and scholars, as well as numerous theological liberals, heretics, Unitarians, and other non-Christians whose anti-Trinitarian, and often, anti-Biblical biases are never divulged in the publication. The booklet does not include a bibliography, utilize footnotes, give volume and page numbers, or otherwise make it easy or convenient for the reader to check their sources for accuracy or context. After one does check out their sources and learns how these sources are either misquoted, taken out of context, heretical, or all of the above, one can see WHY they do not make it easy for the reader to track down and check out the source documents for themselves. It is stunning, even to those of us who are well aware of the WTBTS record when it comes to misrepresentation and prevarication, to see how very dishonest this little booklet is. Can I Misquote You On That? The underlined fraction of the foregoing paragraph is all that is cited in the Trinity booklet. This abbreviated quote is found under the heading, “Testimony of the Greek Scriptures,” yet Fortman’s “testimony” concerning the Trinity and the New Testament— his firm belief that the doctrine is indeed rooted in the New Testament and that the NT writers even explicitly called Jesus God—has been severely abridged so the reader would get the impression that he believed the opposite. The same is true of other Trinitarian sources found in the Trinity booklet—they have all been judiciously “edited” to make it appear as though they support the WTBTS contentions when, in fact, they do not. “Catholic Theologian” Hans Küng was censored by the Vatican in 1979—10 years before the WTBTS used him here—for his extreme liberal views. Küng was one of the bigger names behind the Parliament of the World’s Religions that was held here in Chicago in 1993. The intent of the Parliament was to proclaim the unity and essential equality of all religions and religious expressions—from Hindus and Muslims, to Liberal New Age “Christians,” and decidedly anti-Christian Wiccans. We referred to it as the Parliament of the World’s False Religions, as Biblical Christianity was not formally represented there.5 They were also united by their absolute denial of absolute truth. ☺ It was a very “colorful” extravaganza with the Delai Lama himself showing up with many of his orange-robed followers, along with large herds of liberal clergymen—Catholic and Protestant— holding hands and preaching “tolerance” for all religious views, and with the Wiccans holding nightly ceremonies in a nearby park to “draw down the moon.” In fact, the only “religious expression” that was rejected (and openly ridiculed) by all those assembled worthies was Biblical Christianity with its “intolerant” insistence that there is such a thing as truth and that Jesus Christ is the only way to the Father. So while Küng does, in fact, deny the Trinity Doctrine, he also denies the Bible is exclusively the Word of God and that Christianity is the only true religion. This background explains Küng’s remark about the Muslim’s and the Jew’s failure to “grasp the idea of the Trinity.” To Hans Küng, Islam and Judaism are merely alternate religious “paths” that are every bit as valid as Christianity—Liberal Christianity, that is. To Küng, Biblical Christianity is a backward (and even dangerous) religious expression that is a threat to worldwide religious unity. Ecumenism is Küng’s god, with “tolerance” his only commandment. Küng’s “god” is not THE God of the Bible, nor is his “Christianity” the Christianity of the Bible. We assert that everyone has the right to believe as they choose, but we fervently deny that any and all religious paths lead to the true God! It may, indeed, be politically incorrect to say this, but if Christianity is not the only true and only “path” to the true God, then Jesus Christ Himself was nothing but a liar. He is either the TRUTH as He claimed to be in John 14:6 when He said, “I am the way, and the truth and the life. No one comes to the Father but through me,” or He is just another false prophet—you must take your pick. Judaism rejects the Trinity because it rejects Christ; and when the times of the Gentiles are fulfilled, the remnant of Jews will recognize their Messiah as their God and, then will have no problem with the Trinity. As for the Muslims, they—like the poor deceived JWs—are following a false prophet, and it is one of their highest religious duties to reject the Trinity. Of course Weigall means that no Liberal scholar accepts the entire New Testament as authentic while a very large number of Conservative scholars do; but that’s another topic for another day. But why would a religious organization such as the Watchtower Society—that pays lip service to the authority and authenticity of the Bible—bed itself with Liberal scholars who deny the Scriptures? The answer, of course, is that Liberal scholars are the only ones who will agree with the WTBTS’s positions on so many doctrinal issues. And, cynically, they know that the average JW (and the folks they will meet at the doorstep) will have no idea that many of these quoted scholars deny the Scriptures. Such dishonesty is not unusual for the WTBTS—it is has been their modus operandi for many years. However, the JW’s Governing Body in Brooklyn must be a bit envious of Liberal scholars; after all, they work very hard twisting the Scriptures to reflect their viewpoint, while the Liberal scholars need only to declare as “inauthentic” the Scriptures they do not like! The very name of Paine’s book (not to be found in the Trinity booklet), A Critical History of the Evolution of Trinitarianism, should tell us where he is coming from. But here again, we have another example of the WTBTS giving credence to the viewpoint of someone who dishonors and rejects the Bible! Next, we have their use of Unitarians Alvan Lamson (The Church of the First Three Centuries) and Andrews Norton (A Statement of Reasons) to prove their case that Trinitarianism is not true. Duh! Does anyone think a UNItarian would agree that TRINItarianism is correct? The WTBTS has the right to quote Unitarians in their little booklet, but it certainly would be nice if they identified them as being Unitarians, so we could take that fact into consideration as we read wat they have to say. But besides that—and I know I’m beginning to sound like a broken record—Unitarians deny the authority of the Bible! Could it be possible that the Society does not know Unitarians reject the Word of God? No, they are well aware of what Unitarians believe! In rightly rejecting the “trinity” fable, they go to an unscriptural extreme in the other direction. They believe that not only was Jesus just a man but he was born naturally to Joseph and Mary. They do not recognize Jesus’ miraculous birth nor his death as sacrificial. They believe salvation comes through human endeavors along character- developing line…The Bible is held in high esteem, but it is not considered as God’s inspired and infallible Word. 8 (See also Awake! ** 11-08-52). Again, WHY would a supposedly Bible-based religion give credence to the doctrinal views of people whom they know reject God’s Word? If you are writing a booklet on quilt making, it does not matter at all if you quote Unitarians, Liberals and others who reject the Bible. But if your subject matter is Bible doctrine, it then becomes rather essential to quote people who believe that the Bible, in its entirety, is the Word of God at the very least! Cultic doctrines are born of Bible “difficulties”—things taught in the Bible that are beyond the capacity of human yardsticks or scales to measure and weigh. One stumbling block to understanding the full Deity of Christ is the fact that the Father generated the Son, and yet, Father and Son are co-eternal. There was never a time when the Son did not exist. Is that impossible or just beyond our finite understanding? It’s funny that we are all perfectly willing to accept the fact fire possesses properties unlike the properties of human nature, even though the average person has no idea of how it “works.” Here’s an experiment you can try at home: You’ll need two candles—one to represent the Father and one the Son. You can add a third to represent the Holy Spirit if you like. Ignore the candles—it is the flames we are examining—the candles are just the holders. Light the first candle, and then see how the original flame can generate another upon the second candle. One flame so easily becomes two, yet the first is not diminished. Also, the fire making up the original flame is no “older” than the fire on the generated one. They are the same exact age. Now put the flames together again. Impossible! How can the two be one? Yet, we all believe it. We do not insist that fire cannot exist as it does—that it must fit within the framework of what is possible for human beings. Fire does not possess human nature, which explains why it acts more like fire than like a man! I am not saying that God is fire; only that fire is a well-known entity that does not conform to our nature, yet it is not rejected for that reason. Fire is widely accepted just as it is, but imagine how difficult it would be to try to explain fire to someone who was unfamiliar with it. God is what He is. We do not have the luxury of making up a god that must operate within the bounds of our limited nature. We are finite, God is infinite. Just as a finite human parent begets a finite human child, an infinite Eternal Father begets an infinite Eternal Son. The true God does not possess the nature of man and so does not have to conform to our “way of being.” We must just accept God as He has revealed Himself in the Bible—and the Bible teaches that there is only one God yet, without flinching, asserts there are three divine persons within that Godhead. Chapter 14 ends with Paul exhorting the Corinthians to conduct themselves in a “…fitting and orderly way.” God likes order— not chaos. As far as doctrine goes, however, Peter outright states in 2 Peter 3:16 that some of Paul’s teachings are “hard to understand which ignorant and unstable people distort…to their own destruction.” So, just because some doctrines may be hard to understand, even to the point where false teachers can distort them, does not make them untrue. Finally, the WTBTS states on page 148 of Reasoning from the Scriptures (Reasoning AWAY the Scriptures would be a better title), concerning the eternality of God, that just because our mind cannot fully comprehend the doctrine and finds it unreasonable is no reason to reject the eternal nature of God. How true! Is The Trinity Clearly A Bible Teaching? Even though it is true, as the Trinity booklet points out, that the word Trinity is not to be found in the pages of Scripture, the doctrine certainly is “clearly and consistently presented” there, as was Edmund Fortman’s’ point. The Bible asserts there is but ONE God, and yet also claims that the Father, Son and Holy Spirit —all three—that ONE God! Hard to understand? Perhaps. Unbiblical, no! What people need to understand is that the Bible is not a theology book with a chapter explaining the nature of God, the nature of man, and so on. We might wish it to be so, but it is not that way. Bible scholars throughout the centuries who read the Scriptures carefully and systematically—comparing Scripture with Scripture, armed with a cultural understanding of the times in which it was written, and a knowledge of the language and grammar—have arrived at theological systems and put this information down in theology books. The Bible itself just makes certain assertions—human beings have to figure out how it fits together! Theology is the study of God or things divine. Christology is the study of Christ. Incidentally, the WTBTS has a Christology of its own, but you would never know it by reading the Trinity booklet. They believe and teach that Jesus Christ is Michael the Archangel— both before he was born as a man and again now after his resurrection. Can we find that doctrine “clearly and consistently presented” in the Bible—that Jesus is Michael? No, Michael is only mentioned a few times in the Bible, and it never claims that Michael and Jesus are the same person. In order to arrive at that conclusion, you must read the WATCHTOWER** magazine or the WTBTS’s own theology book, Insight on the Scriptures. So ineffectual and weak is their argument that you will be hard pressed to find a JW who is willing to even make an attempt to prove that Jesus is Michael using the Scriptures. When discussing this subject of the Deity of Christ with a JW, we always insist that they also defend the WTBTS’s teaching about Jesus being Michael from the Bible. One JW elder, who only wanted to “play offense,” told me that the Watchtower Society does not teach that Jesus is Michael! Incredible! He stuck to his story until I produced the documentation (a photocopy of the Feb.1, 1994 WATCHTOWER, pg. 6) proving that they do, in fact, teach that! How can JWs demand that we prove the Deity of Christ from the Scriptures, and yet, be unable and unwilling to prove their own Christology from the Bible? Moreover, as I have already said, the Trinity booklet informs us of all the reasons why Jesus cannot be God without even mentioning, let alone making their case, that Jesus is Michael. Why is that, do you suppose? Do The Ante-Nicene Fathers Agree With The Watchtower Society? The Watchtower Society dances the “two-story two-step” when it comes to the Ante-Nicene Fathers. Story #1 is employed when it seems convenient to infer that the early Fathers were the “early Christians” 13 doctrinally with the Church of today. They need this connection to the early days— some connection, as it were, with Jesus and his Apostles—so they do not appear as just another Johnny-come-lately, nineteenth-century, anti-Christian, religious cult, which, in fact, they are. ☺ The Trinity booklet contains a fine example of Story #1 on page 7 which presents a list of Ante-Nicene Fathers and makes it appear—through linguistic sleight-of-hand—that these men, who were closer in time to Jesus and His teachings, believed pretty much as the WTBTS does today. Story #2 comes into play when it becomes necessary to explain why the WTBTS—calling itself a Christian organization—rejects all essential Christian doctrine as understood and taught for 1900+ years. This is when the WTBTS claims that the people who came on the scene soon after the death of the Apostles (the Ante-Nicene Fathers!) apostatized from the true Christian faith—which the Watchtower Bible and Tract Society thankfully “restored” when they came on the scene in the late-nineteenth century. These Ante-Nicene apostates are to blame for the infusion of Pagan philosophy into the Church, at which point the Christian Church became “Christendom.” More on Story #2 later, right now we’ll look at their portrayal of Story #1—that the Ante-Nicene Fathers believed similarly to the WTBTS when it comes to the nature of God and Christ. Really? Justin Martyr called Jesus a created angel? Justin identifies Jesus, the Son of God, with “the Angel of the LORD” Who appeared to men in the OT times, but never refers to Him as a created being. Let’s look at Justin Martyr’s own words. Like Justin Martyr, we believe Christ appeared as the Angel of the LORD to Moses and other Old Testament saints, but also like Justin, we believe Him to be WHO He said He is—the God of Abraham, Isaac, and Jacob! In fact, the “Angel of the LORD” is the person who identifies Himself by the name of YHWH in Exodus 3:1-14! Irenaeus believed that the Father is the head of Christ just as the Bible teaches, and as we also believe. But keep in mind headship does not imply superiority of nature. Women are under the headship of their husbands, but they are not inferior to them. Men and women share the nature of humanity. But as to Christ’s nature, Irenaeus believed, as we do, that Jesus Christ is God. Oh, NO! Tertullian believed the Father and the Son are different persons? Well, duh! Trinitarians—like Tertullian and like us—believe there are different persons within the nature of the Godhead—three of them, in fact! That’s why Trinitarians happily sing the Holy, Holy, Holy hymn that concludes with “God in three persons, blessed Trinity.” Remember that old song? The Father is the First Person, the Son is the Second Person, and the Holy Spirit is the Third Person all of whom have the same nature. It’s hard to believe the WTBTS thinks this is such a big secret! Well, besides the shocking news that Tertullian seems to believe there is more than one person in the Godhead, what else did he have to say about the nature of God? God, before the creation of anything, existed in plurality! There can be no doubt that the WTBTS knows what Hippolytus actually taught and deliberately edited this out of their deceitful “quotation.” So when they close this section on the Ante-Nicene Fathers with the statement that “the testimony of the Bible and of history makes clear that the Trinity was unknown throughout Biblical times and for several centuries thereafter,” 26 they show themselves to be shameless liars. Now we have to wonder what the encyclopedia meant when it asserted that the Logos and the Trinity doctrines “received their shape” from the Greek Fathers. Obviously they did not mean, as the WTBTS would have us believe, that the doctrine itself was borrowed or derived from Plato or other sources, because they outright reject that theory as just quoted above. The early Church writers merely used the philosophical language of the day to explain the Biblical concepts about the nature of God and Christ to the Greco-Roman culture to whom they were addressing and ministering. The Apostle Paul, while trying to explain God’s omnipresence and great superiority over the Pagan gods, cited a Pagan source saying, “…As some of your own poets have said, ‘We are his offspring.’” (Acts 17:28, NIV) Did Paul “borrow” or derive his Doctrine of God from the Athenian Pagans, or merely use a cultural reference with which his hearers were familiar to explain to them a Biblical concept. We do the same when we write—we use cultural references and the common language, stories, and movies of the American culture of our day to draw analogies to Biblical truth. The snippet of Durant the WTBTS quoted is found on the very next page from the one above! Is it reasonable to believe that the WTBTS did not have any idea that Durant was claiming the paganism that Christianity supposedly adopted came in through the Apostle John? Call me doubting Thomas, but I don’t find that credible. I believe they know exactly what Durant was saying, but they didn’t care, as long as there was a fragment that they could rip from its context and use to slander the Church and discredit the Trinity. When it comes to the Watchtower Society, we had always better check out the rest of the story unless we are looking to have the wool pulled over our eyes. It’s a similar story concerning Siegfried Morenz, the author of Egyptian Religion, 37 who is quoted on page 11 of the Trinity booklet. While it is true Morenz speculates that the Trinity doctrine is of Egyptian derivation; he also believes other concepts, phrases, and teachings of the Bible originate in Egyptian religion—like the Biblical chronicle of David and Solomon, the Proverbs of Solomon, the Creation of the world “through the Word of the Creator,” and more. In short, if we are to accept Morenz’ conjecture that the Trinity doctrine is of Egyptian derivation, mustn’t we accept his other unfortunate suppositions as well? It is also odd that although they cast aspersions on the Trinity because the doctrine was developed over time (as heretical men rose up against the teaching), their supposedly Biblically based doctrines are still being developed as we speak! The leadership in Brooklyn New York is constantly receiving “new light” that outright contradicts what they taught yesterday as truth from God. The poor JWs have to run to keep up with all the changes in the WTBTS’s “Bible-based” doctrines. In fact, their own Christology—the Jesus=Michael doctrine— is one of the teachings that has developed over time. Their founder, C.T. Russell (president from 1884-1916), taught that Jesus Christ could not be Michael, which means that their current Christology is less than one hundred years old! So please do not allow them to condemn your beliefs on the basis that Church doctrine developed over time. It took them 1900 years (if you accept their absurd claim that their organization originated with Jesus Christ in 33AD) to figure out who they think Jesus is today! The WTBTS asserts, on the opening page of this little booklet, that “there are good reasons why you should want to know the truth about the Trinity.” It should be obvious by now that you are not going to get the truth about the Trinity from this source. Although they claim to be the only true Christians, the WTBTS is not an organization of truth. So far we have looked mainly at the WTBTS’s misuse of scholars and quotations that appear in this booklet. In the next issue of the Journal, we intend to answer the Watchtower Society’s supposed Biblical objections to the Trinity and the Deity of Christ. If you would like to have a photocopy of these misquoted sources in their context so you can share this information with a JW friend or the JW who comes to your door, please call our Lombard, Illinois Office (630) 627-9028, or e-mail us at info@midwestoutreach.org to request these documents. Think about it—the “attitude” the individual JW accords the leadership and how they treat them determines their eternal destiny;and they also are taught that to even question the WTBTS is to be disloyal to God. Can you understand why it can be so hard to share the Gospel or discuss the Bible with a JW? They are wearing WATCHTOWER glasses. He (or she) has been persuaded that by merely giving an honest ear to what you have to say, he is indulging in independent and contrary teaching, which could cost him his eternal life! That is where this documentation comes in—not to enable you to humiliate an adversary, but to perhaps, with the help of the Holy Spirit, and with the care and compassion that you would want to be shown if the situation was reversed—open their blind eyes to the true nature of the ravenous wolf they serve. You want to raise this question in their minds: How can such dishonesty be of God? How can such a dishonest group really be “Jehovah’s Organization?” If you can, through careful exposition of the WTBTS’s falsehoods, bring them to the point where they dare to question whether the WTBTS really is “Jehovah’s Organization.” Then you can progress to discussing the Scriptures with them, so you can introduce them to the God of Grace and the true Jesus Who is the only Savior. May God bless your efforts to witness to these lost souls who cross your path.